All of this year, we’ve been working on a massive project to change how we make decisions. In my opinion, the very backbone of a Students’ Union is how it enables its students to have their say and make change, which is why its so important that we update our structures to reflect what our students want. This project started at the Annual General Meeting in 2015, when you voted for a policy called “It’s time to re-think how we do democracy – reforming the Union’s democratic structures“. In this, you asked us to prioritise reform of our democratic structures and processes and bring proposals back to the AGM in 2016. Throughout the year, we’ve gone through an initial survey, research into what other Unions do and the principles of student democracy, trials of different structures, a lot of head scratching, and have now presented the proposed changes at Democracy Zone and Union Council. Attached below is a survey so you can have your say before the changes come to Union Council and the Annual General Meeting for approval. Improve You Make Change, which has proved to be really popular so far, and so will become the new cornerstone of the decision making process. We will be making significant improvements to the website too, to allow for more student feedback and interaction. So essentially, every student submits their idea to You Make Change, where other students can discuss their opinions. The full-time officers will then decide how to deal with the idea in the most fair and efficient way: This might mean just doing it, taking it to a Zone to decide, or taking it to Senate for a mass student vote. Sports Zone meet to discuss the idea. They are also encouraged to reach out to the wider student body to listen to their opinion- for example they might use a Tap Choose Change stall, or put out an online poll. Sports Zone might decide to just approve the idea for themselves, but if they think the decision is too big for them to make alone, they can refer it to Senate and ask for a mass student vote. The whole student body gets to vote on whether or not we should have a 24 hour gym, and if the answer is yes, the VP Sports Development will have to go away and put together an action plan to make this happen. This plan will go back to Sports Zone for approval, and every student will be able to follow the actions and progress via the website. These are still ideas at the moment, so I need to know what you think of the changes- after all it’s all of our students who should be using this new process! Please fill in this 5 question survey before next Friday (26th feb), and let us know your thoughts! We will also be holding an open meeting to discuss the proposed changes on Monday 7th March at 15:00. This is so you can come and have your say on the ideas before they go to Union Council. After Union Council, where we will be proposing the overall changes, we will take the full list of details and rule changes to the Annual General Meeting in May. An idea can literally be anything you want to improve at the Union, University, or World. No matter how big, or small, any student can suggest a change. An idea doesn’t have to contain a perfect solution, it could even just be a highlighting an issue you want to see solved. Everything we do at SUSU is categorised into Zones to help it make it easier for you to get involved with the things that interest you. Each zone is headed by a Full-time officer and is sat on by elected student representatives who are passionate about that area. The Zones are: Sustainability, Student Communities, Creative Industries, Education, External Engagement, Sports Development, Student Life, and Democracy. There’s more info about the Zones here. What are/who are Full-time officers? Full-time officers are students who have taken a year out during or at the end of their degree to run the Union. They are all elected by the student body and its their full time job to keep things running. There are 7 Full-time officers and they all look after different Zones and aspects of the Union. You can find out more about them here. What about things that don’t fit into a zone, like events? We will be introducing a new Operations and Services forum, which will be a sounding board made up by elected students to have their say on ideas regarding big events, such as Freshers’ and Grad Ball. There’s more info on this new committee in the link to the full information above. How will Senate be different from Union Council? Currently, Union Council is the body where all decisions go to, and its often perceived as being quite complicated and bureaucratic. Senate will not have the same powers as Council as the power to make actions happen (that used to be policy) will go to the Zones. Senate will be a political oversight body sat on by less members than Council, will meet less often than Council, and one of its key responsibilities will be to call mass student votes. How is this an improvement to the current system? At the moment, Union Council only engages around 40 students out of our whole 24,000+ student body, and many students don’t know, care, or understand how it works and how they can get involved. The new system plans to open up decision making so any student feels empowered to suggest ideas and make things happen. The process will be less bureaucratic, and more power will be given to more students who are passionate about their Zone. There are so many flexible ways to get involved with the new system. Anyone can submit an idea, give feedback to other students’ ideas, and discuss issues at meetings with no commitment or position necessary. All students will also be able to vote in mass student votes. If you want to be able to vote at a Zone or Senate, there will be 44 new open positions that all students can run for in the Summer, so you could get elected to make change at the Zone you’re most interested in. If you have any other questions or comments, email me at vpdci@susu.org, or put them through You Make Change on the website. 2 Comments on "Introducing… The New Democratic Structure!" I’m sure this was a lot of hard work and there are some great ideas here – the operations & events board in particular should go a long way to help affect commercial decisions and reduce any disconnect there. A problem I can see however is that the full-time officers do appear to have too much power in the new structure. Since one of the options on getting an idea is “do nothing”, this means ideas can be thrown out by a fairly small group of people who are very close to the organisation – no disrespect intended whatsoever here, its just the nature of being a sabb would mean you lose the ability to see things “from the outside” and are probably more swayed by things like what the senior leadership team may have planned. This is quite a big departure from the previous stance of how anyone can bring an issue to council and get a policy passed. As a mass student vote can be caused by a petition, prehaps the You Make Change discussion can be used to perform this? i.e. if an issue has a certain number of “upvotes”, regardless of other action, a mass vote is triggered. 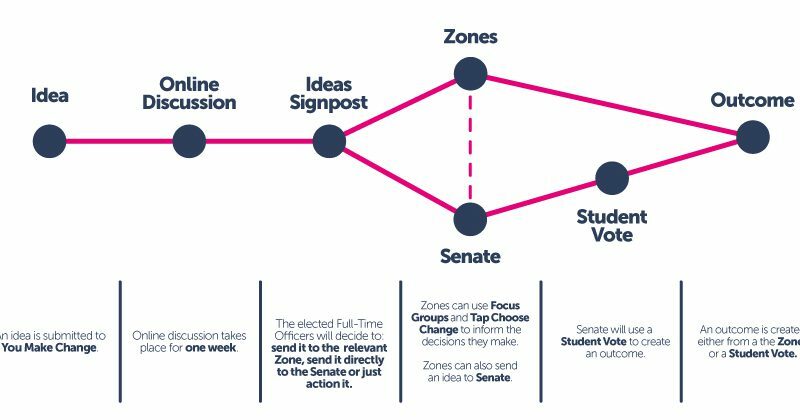 So on the diagram an explicit route can also be drawn from the “online discussion”/”ideas signpost” to the “student vote”. The only reason I suggest that is otherwise it will be next to impossible for one student to gather the numbers required for a petition otherwise as there is no platform to do so. It also goes against the whole idea of just one person being able to make a big change which has been popular in open council, which I think have actually been quite positive and well received. Great that this is being looked at however and look forward to hearing any thoughts! 2) As YMC will be online, all students will be able to see what happens to ideas- and give feedback if they dont agree, so they will be able to comment on the ideas signposting stage. 3) FTOs will also report on the relevant YMC submissions at Zone meetings, the member of the Zone will also be able to scrutinies FTO decisions on where ideas go. 4) Formal accountability (e.g. disciplinary) will be the responsibility of Senate, so they will also have oversight over FTO decisions. So basically, I do see your point, but hopefully the general attitude of greenlighting imbued in the system as well as the structural elements of accountability would prevent this ever being a problem. The only reason the ideas signposting stage exists is to speed up the journey of making ideas happen, as FTOs work here full-time and work with the staff who can make ideas (like the e.g. of the veggy burger) just happen. Your second point is an interesting one. I don’t quite agree with your statement about the departure from anyone being able to get a policy passed, because if anything this system should open up democracy even more. Every student will be able to submit ideas (which lead to actions- the new more practical version of policy) without the potential barriers Council presents in the way of a certain level of prior necessary knowledge of the workings of council, so I would say it’s a step further in the direction of all students being encouraged (not just allowed) to bring up issues. Your idea about a direct route from online discussion to student vote is interesting. Do you suggest having a facilitated version of a petition on the website? It’s certainly something we can discuss at the open meeting, I guess we’d have to think about the quoracy for the petition as well as how it is facilitated on the website. Thanks for your feedback – please let me know if you have further thoughts about petitions and do come along to the open meeting to chat about it!